I’ve often wondered if my attending a lecture at my high school is the reason my life is what it is today. You know, the idea that one decision aligned everything so that I would follow a certain path. Maybe my life is what it is because I chose that high school – which would lead to my hearing the lecture. Or, maybe it’s that I mentioned this speech to a colleague at my part-time college job. Or it could be that I accepted that job when it was offered to me, which would lead to my meeting this colleague to whom I would mention the lecture which led him to suggest a karate school. Anyway, I was a sophomore in high school when a physician came to speak to my class about women’s issues. One of his topics was prevention of assault, and his advice was to be prepared to defend ourselves – and by that, he meant martial arts. I always kept that pearl of wisdom in the back of my mind, and during my first semester at college, I enrolled in taekwondo classes to begin my study of self-defense. That’s when I met Norm – at the Yang Moon School of Taekwondo. 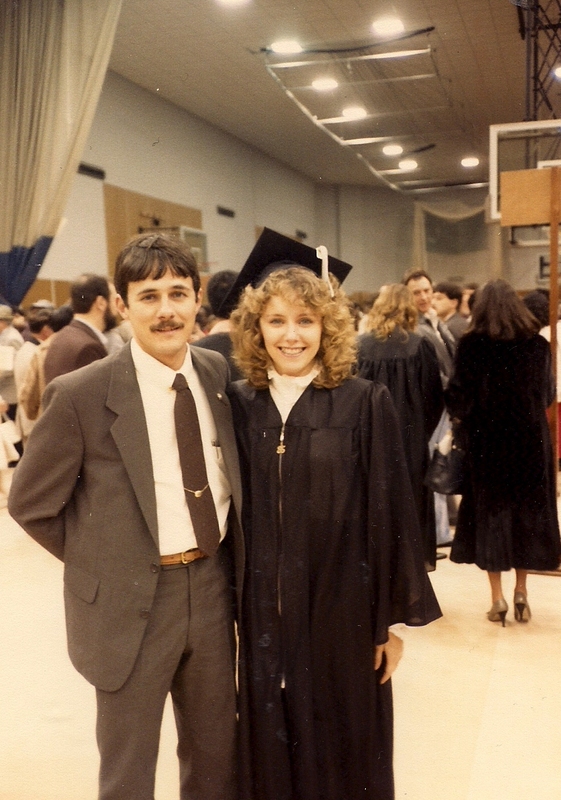 I was a freshman at the University of New Orleans; Norm was a sophomore and a second-degree black belt and part-time instructor at Yang Moon’s school. 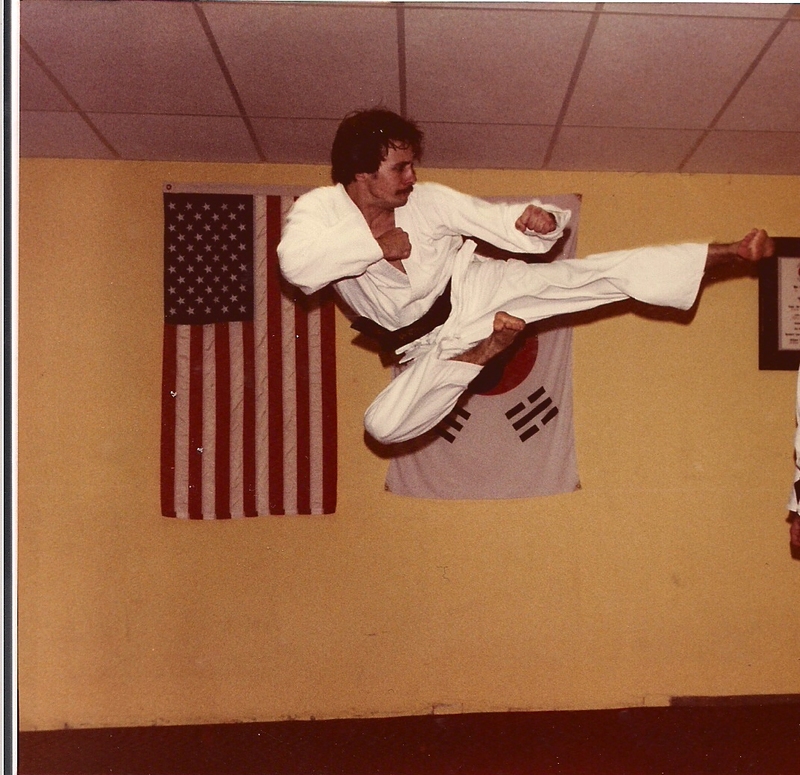 Here’s Norm demonstrating his karate prowess in class – a flying side kick. Who wouldn’t be smitten by such strength and agility, not to mention his good looks? I kept up lessons and eventually earned a black belt myself two years later. 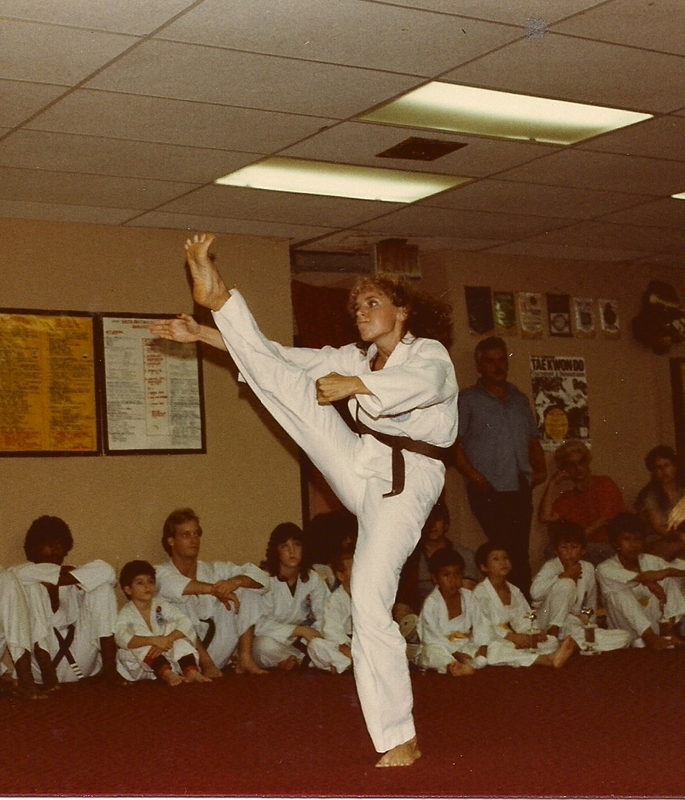 At my black belt rank test, I demonstrated a pretty good front kick (and mean mug) while doing the Koryo form, don’t you think? Norm (after Friday night karate class): If anyone would like to go to Jazz Fest, a bunch of us are going to meet up tomorrow morning. Just give me a call if you want to go. Stacy Lyn (Saturday morning): Hi, Norm. This is Stacy Lyn from karate class. Would it be all right if I ride to Jazz Fest with you? He says he made the announcement so that means he asked me. I say I made the phone call so that means I asked him. Of course, his being a Southern gentleman, he wouldn’t dream of letting me pay for anything that day – which meant, by default, that we were there together. If that weren’t a big enough clue that we were now a couple, his arm draped around my shoulder while listening to music might have given us away. Kind of a strange way to make a first date, but that’s the way it happened. We fell in love and spent the rest of our college careers getting to know one another. There is nothing earth-shattering about our courtship – it was pretty normal. We used to hang out at Lake Pontchartrain between classes. 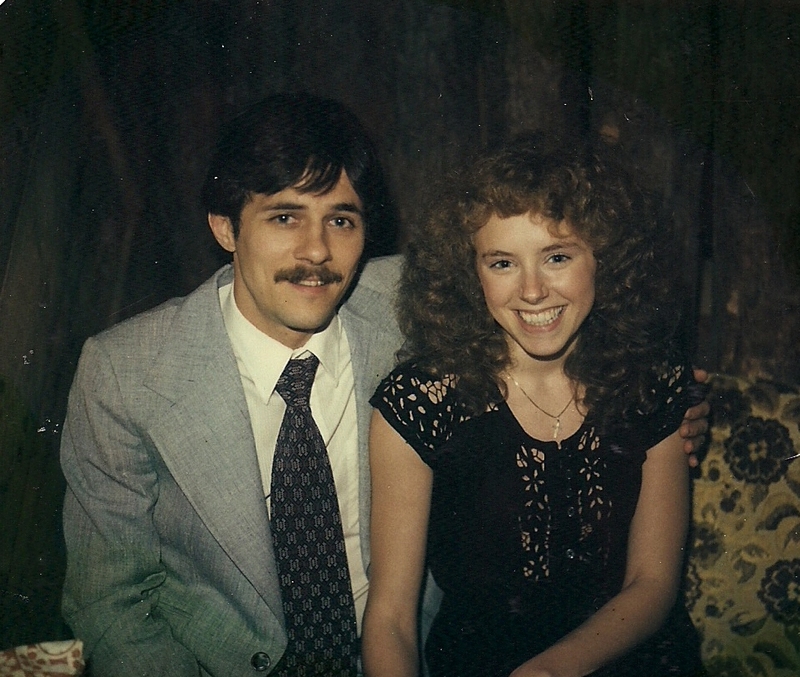 For special occasions, we went to dinner together, as we did on Norm’s birthday at a now-defunct restaurant in New Orleans called Anything Goes. 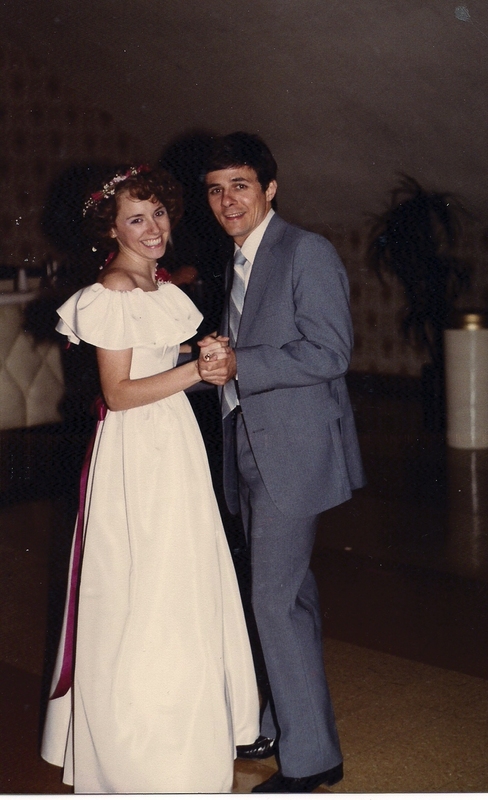 We also attended family functions together, too – like my older sister’s wedding. 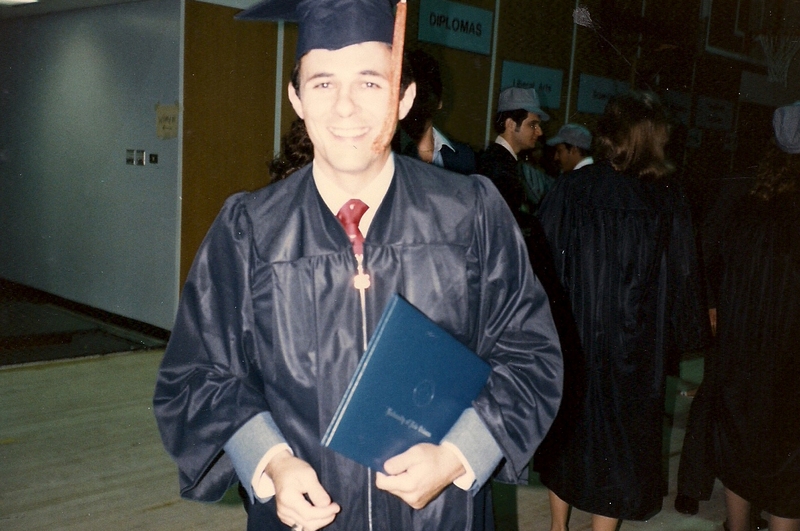 A few short years later, Norm graduated from UNO with a Bachelor of Science in Electrical Engineering. He landed a job out of state, but I wasn’t finished with school yet, so I stayed in New Orleans while he worked, just waiting for the time when I could join him. How long ago this courtship seems, yet somehow it seems like a few moments ago as well. How can that be? Time is a trickster. See how what seems to be a simple decision – in my case, to attend a lecture when I was a sophomore in high school – leads us down the path we are supposed to take in life? See? This is the cutest story! You two were adorable back then (and have only grown more adorable over the years) ❤ I hope Gus and I are this cute when I tell our story of hypothermia and hot tubs in 20 years. Aaaaw! What a sweet story! You make a beautiful couple. And yes, I can believe that two people can meet at Taekwondo, my son is a black belt and he met his first girlfriend there, and his life long best friend who married the girl he met at Taekwondo! I have been to many a tournament and know all the kicks you mentioned. An excellent means of self defense and self control.